Sudden onset or a temporary clear discharge from the eyes can be caused by injury (although this is unlikely if the discharge is from both eyes), allergic reaction or an upper respiratory tract infection – just like when humans get watery eyes when suffering from a cold. If your cat has a respiratory infection he is likely to also develop a wet nose. Cats in which a clear watery discharge from the eye is the only symptom can be treated with a twice-daily saline eye drop (specifically for cats) to help cleanse the eye and tear ducts. If your cat suffers from a reaction to an environmental stimulus (for example an allergy) this treatment should offer mild relief. If your cat has become lethargic, or there has been any change in his behavior or health, it is likely that the wateriness is an exterior sign of an underlying illness and you should seek a thorough veterinary examination as soon as possible. In cases where there are no other symptoms, chronic eye watering can be due to a range of causes – including conjunctivitis, ulcer, cataract, glaucoma or distichia. In most cases, these conditions would result in only one eye being affected, and that eye would also exhibit cloudiness or redness of the eye. The most likely cause of a watery eye in cats is conjunctivitis. The eye reddens because of the increased flow of blood and swelling of the mucous membranes is sometimes seen. The most common cause of conjunctivitis is herpes, a virus that is sometimes compounded by a secondary bacterial infection. There are several treatments for herpes – antivirals such as idoxuridine, trifluorothymidine, and vidarabine can be administered as eye drops. Rinsing your cats eye with a saline eye drop (specifically for cats) will also help. An opacity in the lens of the eye is most commonly attributed to either a cataract or sclerosis of the eye. 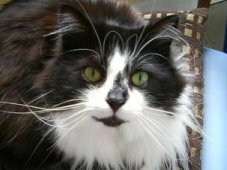 Sclerosis only occurs in cats in old-age, so any cloudiness in younger cats is normally the result of a cataract. 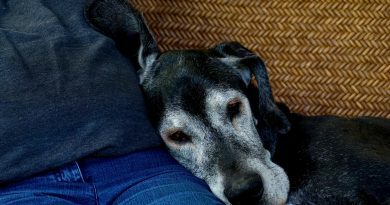 However, a cataract can only be confirmed by a thorough veterinary examination, and your vet will design a treatment plan to not only cure the cataract but will address the underlying cause. A cataract describes any opacity in the normally clear lens of the eye, and prevents light from reaching the retina at the back of the eye, sometimes eventually leading to blindness. Inherited conditions are the most common cause of cataracts and may be present at birth or develop when the animal is very young. 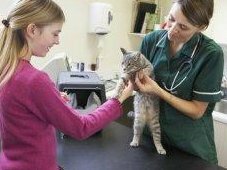 They can also be caused by injury, or illness such as diabetes, in which case treatment of the underlying condition is essential – if your cat has diabetes failure to treat this will lead to further complications. Cataracts can be removed surgically by a veterinary ophthalmologist, who would replace the lens with a plastic or acrylic prosthetic lens to allow for more focused vision. Although usually highly successful, cataract surgery requires a lot of postoperative care. It is also possible that your cat suffers from an inherited defect in which a malformation of the tear ducts blocks the normal flow of tears. This condition is actually called “Watery Eyes” and is often accompanied by stained fur around the eyes.